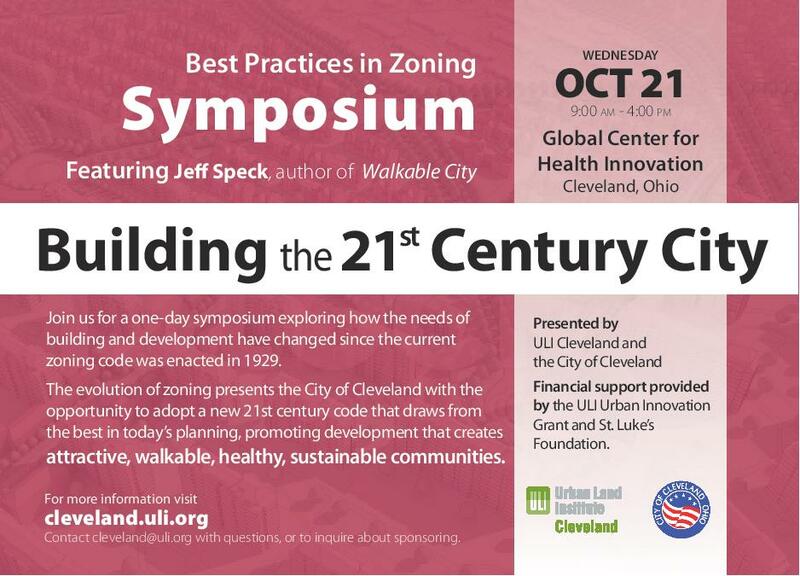 The City of Cleveland Planning Commission and Urban Land Institute will host a one-day symposium on Wednesday, October 21st from 9:00 a.m. to 4:00 pm at the Global Center for Health Innovation to explore how the needs of building and development have changed since implementation of the city’s current zoning code in 1929. In addition, the symposium will focus on how the City of Cleveland can adopt new zoning tools that will draw from best practices and create attractive, walkable, healthy, and sustainable communities. The symposium will feature a conversation with civic leaders, city staff, Community Development Corporations, private developers and other known stakeholders about their experience with the current zoning code and related regulatory procedures. Several nationally renowned speakers will outline the principals, benefits, and practical challenges of modern zoning regulations. Speakers will also discuss strategies and specific regulatory tools that can be implemented to incentivize the development of healthy, walkable, mixed-use neighborhoods that offer a variety of transportation and housing options for all citizens. Scheduled session for the forum include: Making Safe Streets, Form-Based Codes 101, Planning as Politics, as well as many others.